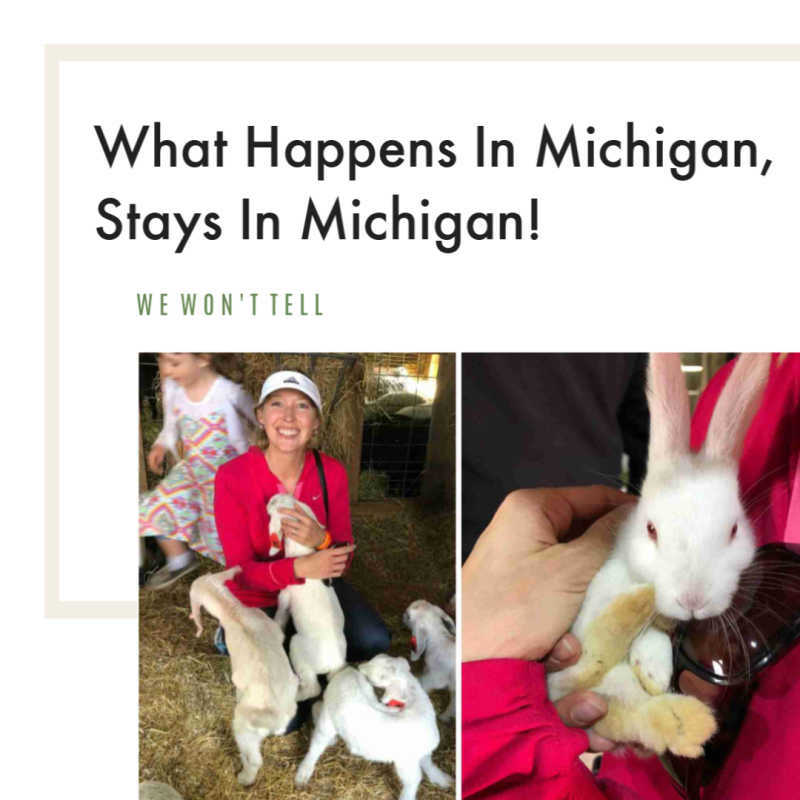 Come visit Cheboygan Michigan, we bet you will have a blast! This city has a rustic, need to-be-explored feeling. We love the lighthouses, state park and trails for biking, hiking and snowmobiling. Plus there are some great restaurants! 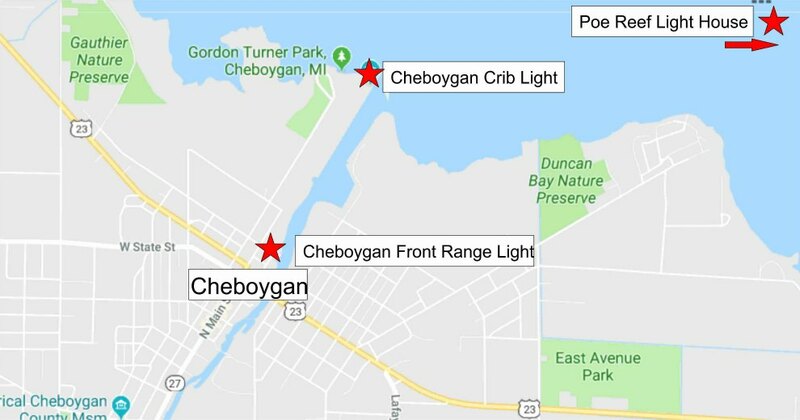 Cheboygan is a great town to catch dinner if you are heading south after a trip to Mackinac City. North Central State Trails- 62 Miles, Crushed Stone. Trail activities: Biking, Fishing, Horseback Riding, Mountain Biking, Snowmobiling, Walking, Cross Country Skiing. Mackinac City to Gaylord. From the northern end, the trail starts just south of the Mackinac Bridge spanning 5 miles across the Straits of Mackinac to join the Lower and Upper Peninsulas of Michigan. The trail head has parking, restrooms, and water. Starting in Mackinaw and heading south, the trail is paved and well used for the first half mile, after which its surface turns to well-maintained crushed stone, and usage declines. The route is mostly flat and it's well used for snowmobiling. North Eastern State Trail-71 Mile, Crushed Stone.Trail activities: Bike, Fishing, Horseback Riding, Mountain Biking, Snowmobiling, Walking, Cross Country Skiing. Cheboygan to Alpena. The 71-mile North Eastern State Trail provides a mostly solitary experience as you traverse through wetlands, farmland, forests, and a few small towns. Starting from the Cheboygan Michigan trailhead, which intersects the 62-mile North Central State Trail, people on bikes may find the riding fairly slow given the not-so-compacted crushed limestone surface. Ends in Alpena. Mountain bikes are recommended. Carry lots of water and have the ability to fix a flat tire if you are on a bike. North Western State Trail-32 Miles, Asphalt and Crushed Stone. Trail activities: Bike, Inline Skating, Fishing, Wheelchair Accessible, Horseback Riding, Snowmobiling, Walking, Cross Country Skiing. Mackinac City to Bayview. The rail-trail is open to all non-motorized uses year-round, and to snowmobiles from December 1 to March 31. The northern section of the trail, from Mackinaw City to Alanson, is hard-pack aggregate and asphalt. The southern 7-mile section between Alanson and Petoskey is paved with asphalt. Near the North Western State Trail’s southern end at Spring Lake Park in Petoskey, you can hop across State Route 119 to pick up the Little Traverse Wheelway. 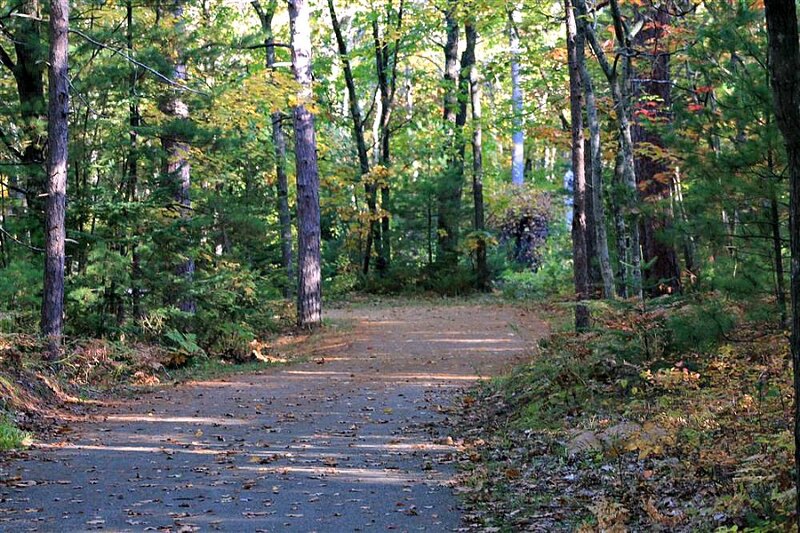 The paved 26-mile rail-trail extends north to Harbor Springs and south to Charlevoix. Huron Sunrise Trail-8 Miles, Concrete. Trail activities: Bike, Inline Skating, Wheelchair Accessible, Mountain Biking, Walking. The scenic trail links the town with Vogler Conservation Area, a 270-acre forest preserve (which also has many trails for hiking and mountain biking), Hoeft State Park and 40 Mile Lighthouse, which includes a museum and a picnic area. This is our favorite trail because it's paved, boasts fantastic views and allows for lots of photo worthy stops. You will enjoy views of Lake Michigan and its shoreline. 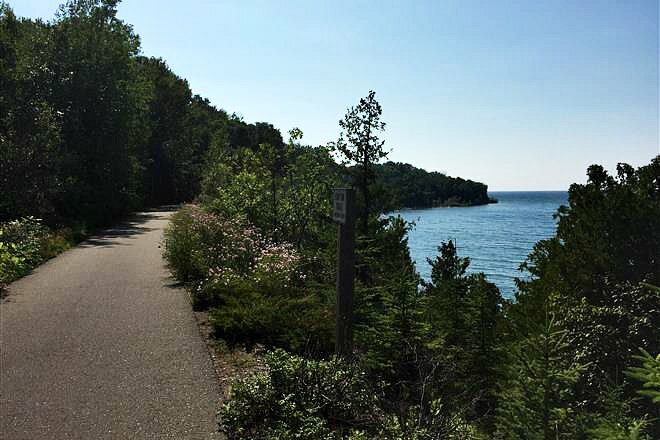 The paved trail rolls for 24 miles from Charlevoix to Petoskey to Harbor Springs as it follows the curve of Little Traverse Bay. We hope this overviews helps you narrow down your trail selection. Visit https://www.traillink.com for more information on trail heads, parking and detailed maps. Above is a map we made to help you find this city's lighthouses. Poe Reef Lighthouse-This historic landmark is located east of Bois Blanc Island in Lake Huron. 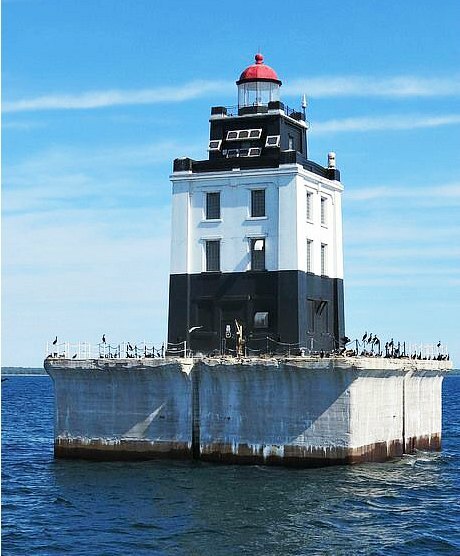 Cheboygan Crib Light: This pretty lighthouse is right on the Cheboygan River at the mouth of Lake Huron. Cheboygan Front Range Light- Located at 606 Water St. Enjoy camping, hiking and fishing at the State Park located right on Lake Huron. There are five hiking trails ranging from .5 to 1.75 miles. 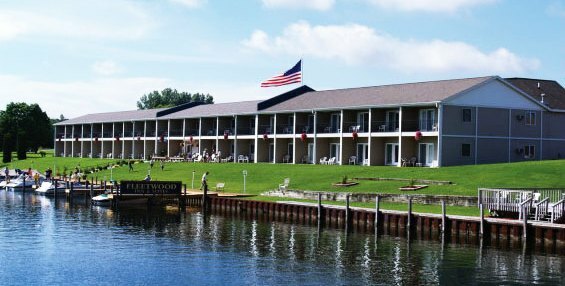 You can camp, stay in Cheboygan Modern Lodge, enjoy a rustic cabin or if you are feeling adventurous, stay in their tepee. A carry-in boat launch is located on Duncan Bay and fishing is available both on the bay and on Elliot Creek. Sooo many shells and rocks to discover at Sea Shell City! It's a great place to get souvenirs. Once you get inside you will definitely find SOMETHING to pique your interest. They carry lamps, nightlights and tons of home decor! 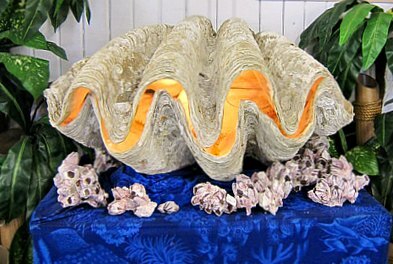 Sea Shell City is open for business from April 1st through the third weekend in October of every year. So you've been hiking or snowmobiling all day and you need a good meal. We have a couple suggestions for you! Mmmm. They have pizzas, homemade lasagna, subs and more! They are famous for their pizza because they make their dough fresh daily and use fresh veggies, homemade sausage and cheese. History: In 1976 Donald and Geraldine Dorey opened This Old House after retiring from the Detroit Fire Department. Don, while on the Detroit Fire Department, fell in love with cooking, so after his retirement he decided to open a pizza place with his wife and four children. How cool is that?! Looking for a little more upscale restaurant? This place is it. Pastas, salads, seafood, burgers and more! We love the option to relax and dine outside on their deck while watching the boats pass by in the summer is a treat. Try the Lobster Tots, Coconut Jumbo Sea Scallops or Prime Rib Sliders! Plus their desserts are to die for! All rooms face the inland waterway so you are guaranteed a great view! All the rooms at the Waterway Fleetwood are furnished with a fridge, microwave and coffee maker. The suites have an upgraded wet bar, with a bedroom and separate living area. Photo courtesy of Fleetwood Hotel.